Medici-style coronet with pearl edging and lace-edged veil,original bridal bouquet with lace edging to match the gown. For Madame Alexander, brides were a perennial favorite. Both contemporary and period designs were always part of the Alexander selection. 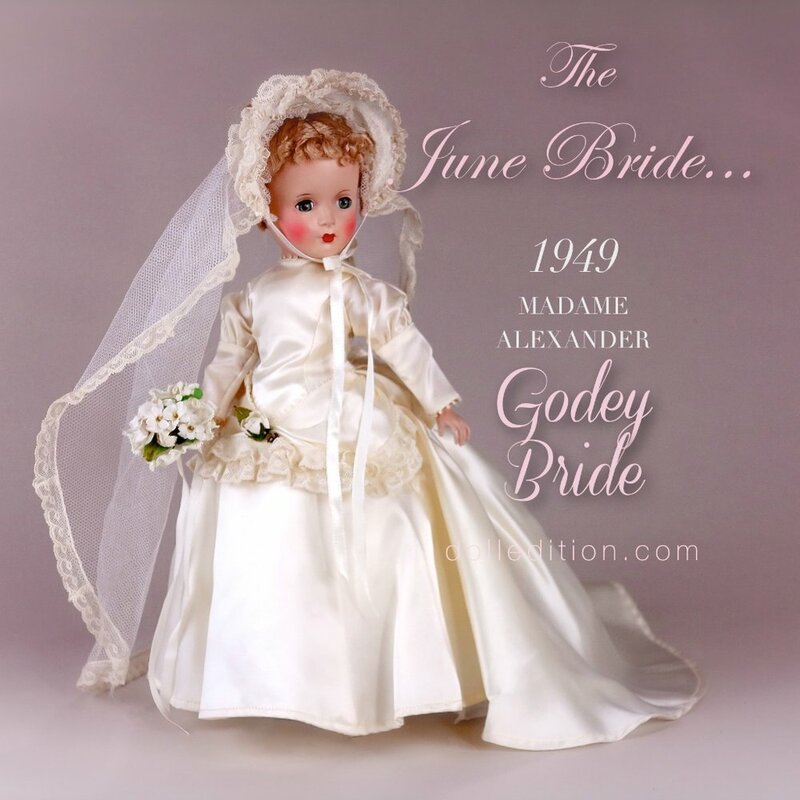 This featured bride is from the Godey period. This roughly translates to early Victorian costuming and tends to work well for the Alexander aesthetic. The Godey's Lady's Book published fashion plates for decades and is a period of European fashion especially well documented. It also tied into the style of the American Civil War. The magazine is best known for the hand-tinted fashion plate that appeared at the start of each issue. Among the many beautiful illustrations reproduced here are morning dresses, walking suits, riding outfits, ball gowns, capes, children's costumes, plus hairstyles and a full array of accessories — shoes, bonnets, gloves, muffs, fans, walking sticks, and more. Captions detail the rich fabrics, color schemes, and decorative trims. The Godey Bride by Madame Alexander is strongly influenced by a standard established at the 1840 wedding of Queen Victoria. At the time of her marriage to Prince Albert, the wedding gown was generally any gown of the brides choice, and probably something she already owned. Knowing that her dress would be reported on around the world, Victoria chose to wear a dress trimmed with handmade Honiton Lace from the small village of Beer, to support the declining lace trade and give the industry a boon. White, she reasoned, was the best way to show off the lace makers' artistry. In 1849, Godey's Lady's Book, the Vogue of the Victorian world, decreed: "Custom has decided, from the earliest ages, that white is the most fitting hue, whatever may be the material. It is an emblem of the purity and innocence of girlhood, and the unsullied heart she now yields to the chosen one." An illustration of Queen Victoria and Prince Albert at their wedding service. Medici-style coronet with pearl edging and lace-edged veil, original bridal bouquet with lace edging to match the gown.